The flashy affair was over. Finals were happening in a few days and The Kid was ready. We attended the Senior Parent Breakfast and waited to pick up our cap & gown. You will notice I talk about this moment as if it were mine but we worked at this. So, we celebrated this moment together. Now, this senior breakfast wasn’t a high point for me. Especially after I saw that buffet line. In true fashion, that kid knew I wasn’t about that life and he got my pancakes. Not wanting to be a brat I stood in line for the other portion. During the running around, we took this picture. Yup – he got me by a few inches! God answered my prayers. 😉 This was the final whoo rah for the seniors. The final grades were being calculated and the verdict would be announced the coming Friday. These 10 days were taking the longest time to get to us. This was the only moment we were really waiting on. I told you about part of our struggles to get here. See, his dad graduated out of summer school and he didn’t want to repeat that experience. We worked our asses off, he more than me but I kept a light fire under it to keep him on his toes. Then June 9th happened and he handed me this when we met up with each other. For the 3rd time during this journey, I shed a few tears. He reached over and hugged me exclaiming “I told you I’d get it done.” This cap and gown made it real. I held on to that thing like it was mine because somewhere in my soul it was. I worried, prayed, and cursed to get him right here. I’m that teenage mom that had never even baby sat a child and here I was about to watch mine walk across the stage to accept his diploma. My expectations were firm but my methods kept changing but he did it. Yeah, it would’ve been easier if he had done it my way but this was his story. I needed to let him do it his way. So the morning of the graduation was here, and I posted the picture that matched my mood. Hashtag #TheFinisher – I was beyond ready and I even packed a handkerchief. This picture captured everything I was feeling about this meeting. In a graduating class of 262 students, all I could see was him. He strolled pass me as they marched in the theater of the Michigan Opera House. This was a long ceremony and for a short moment, I was ready to rip all the programs up because I didn’t see his name. When I found it in its respective area, #CarryOn. Then they asked the graduates to stand up and I was on my muthf’n feet -which happened to be in some 5″ heels but let’s go. Then I got this message: I remember this paper being in his room on his desk and of course he forgot it. Now, I gotta run down the aisle like I’m on the Price is Right. Then I got back to my seat and cheered for all the kids that spoke when they were on the phone with him, introduced to me, called me “Ma, Auntie & Ms. Wilson.” Then I saw him make his way to the stage. #Leego The announcer said Lorez Wilson and I lost it – screaming, clapping, jitting up the aisle (my footwork was unmatched) and I did all of this while taking pictures. Did you notIce me mention I cried? NOPE! I had shed all the tears prior to this day. This day was for smiles. We did it. In 1999, this event seemed to be a million years away but with each passing year, I realized how close we were. As we made our way out to the streets of Detroit, I couldn’t wait to see him and congratulate him one more time. I found him in the swarm of black and yellow. His smile was as bright as the day but I saw something in his eyes. We snapped a few images in the daylight. 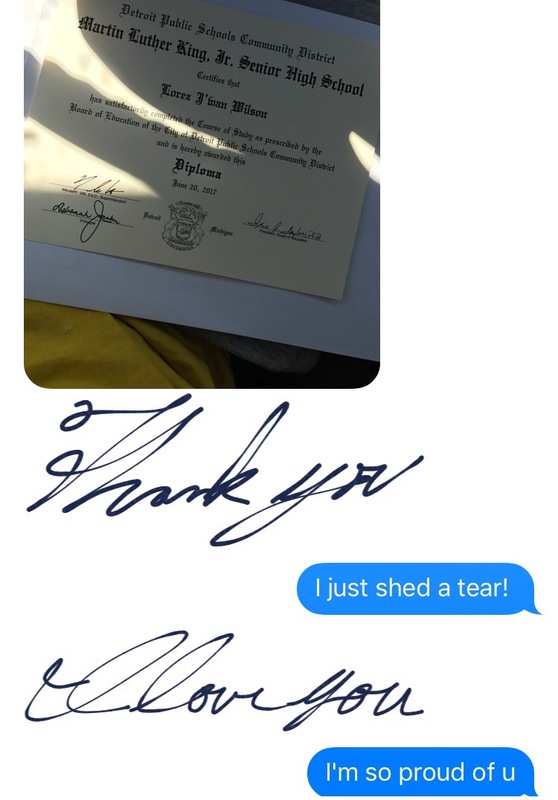 I asked to see the diploma and he told me they had to pick it up from the school later on. WTH DPSCD? We left headed to Joe Muer for lunch with Grandma. Oh yeah, I forgot to tell you he cut his hair off prior to graduation. I was looking at a young man ready to make his mark in the world. Little did he know he had already done a good amount of that through me. I was different because and for him. He is the best part of me. Everything I never knew I needed. While we were at lunch I learned his dad had not shown up to the graduation, after I gave up my opportunity to monopolize this event. I knew I saw something in his eyes at the theater. It was sadness. Afterward, he went and got a tattoo (how could I say no- I have 16) and I sat down to REST. I thank everybody that was on this journey with me. All of your help was and still is appreciated. You never left me out here to do this by myself. The village of Marti truly came through for this kid. There are so many to name but I’m positive I’ve already told you personally. Eternally grateful to you all for everything because I know your love for him is an extension of the love you have for me. August 1st, while I’m sitting in my chair at work listening to inspirational music this little exchange occurred and it gave this chapter closure. As we tackle this next mission, I’m positive he’ll be just fine but I’ll be right there to throw an assist if needed.